Extensive scientific research shows that OptiZinc is the most bioavailable and bioactive form of Zinc tested. 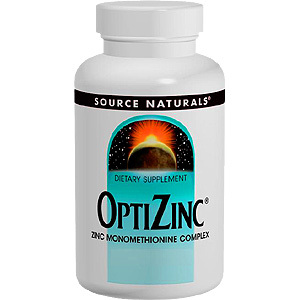 Aside from demonstrating superior absorption and utilization by the body for Zinc's many functions, OptiZinc is also more efficient than other forms of Zinc in getting needed Vitamin A out of storage in the liver, thus making it available for use. Perhaps most outstanding is the synergy offered by this combination of Zinc and Methionine: while both of these nutrients are well-known for their freeradical-neutralizing properties, the antioxidant activity of OptiZinc far surpasses that of either Zinc or Methionine alone. 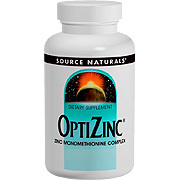 Source Naturals OptiZinc Zinc supplement is suitable for vegetarians and HYPOALLERGENIC. contains no yeast, dairy, egg, gluten, corn, soy or wheat. Contains no sugar, starch, salt, preservatives,or artificial color, flavor or fragrance. One OptiZinc tablet daily with a meal. Warning: If you are pregnant or breastfeeding, consult your health care professional before using Zinc product. Zinc (as zinc monomethionine [OptiZinc]) 30 mg, Copper (as copper sebacate) 300 mcg. Other Ingredients: Microcrystalline cellulose, dibasic calcium phosphate, stearic acid, modified cellulose gum and colloidal silicon dioxide. OptiZinc is shipped in a discrete, unmarked package. Orders are processed immediately and usually take about 3 to 5 working days to be received. We do ask that you try it for 2 to 3 weeks to feel the full effects. Any information received is used only for order processing and shipping purposes. Your information, such as e-mail address, will never be disclosed to a third party.